Trademark name for distribution. 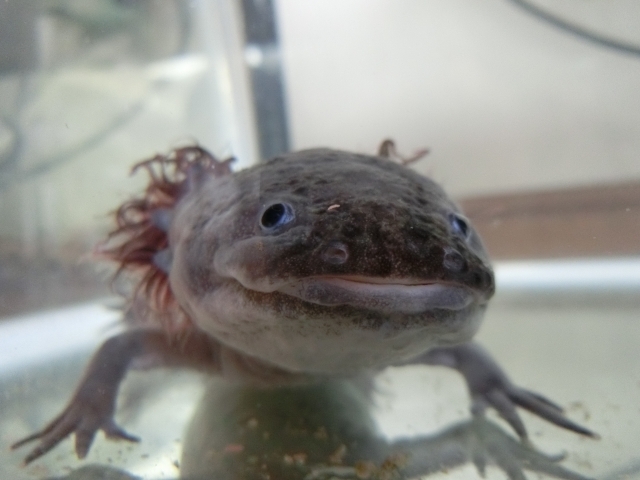 The official name is Axolotl. The Japanese name is Mexican Salamander. A fellow of salamanders native to Mexico. by the Washington Treaty as an endangered species. Those that are distributed are artificially breeded individuals. They are amphibians but mature as young bodies. so they have a very long life. that it requires summer high water temperature measures. and do not want to keep multiple individuals together. "You do not have this?" A bottle packing container whose lid is a handle. at the UFO catcher of the game center. because I have played goldfish scooping past. but I can not refuse myself before the old man has weakness. While looking delightfully, I will receive it reluctantly. which was once used for breeding Japanese rice fish. which declined one after another, disappeared. I stare at the face of the wooper-looper. Indeed, nothing is not pretty. However, it looks like a tadpole with legs growing. There is a sense of discomfort. It is creepy and disgusting. Yes, it looks like a fish in the face of a person. with a body like the old man from the neck down. If I look it up on a smartphone, it seems to be edible. but I want them to stop. I feel nauseated. It is almost a bad taste. But, now, what is it? It is close to killing as a mood to kill. but that is also a problem. Somehow, this wooper-loopery night is troubling forever.